Earlier this week, I braved the early-arriving blizzard to see Straight No Chaser, who performed at the Iowa Memorial Union. 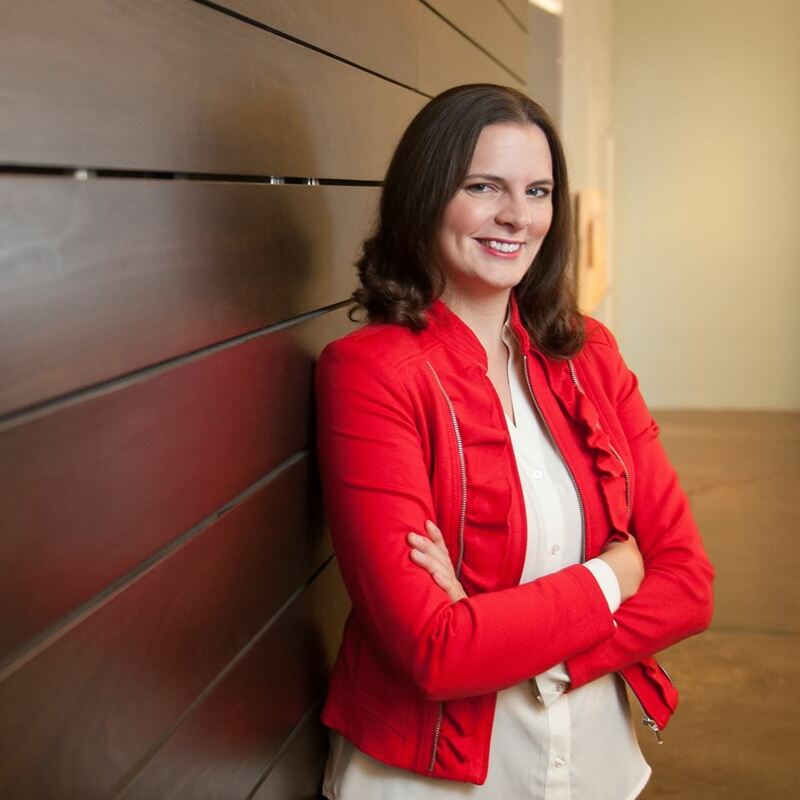 Having purchased a ticket more than a month ahead of time, I had been eager to go to the concert, but was unsure of whether or not I would have the time to, given that this past week has been "Hell Week." However, I went against my better judgment of bad weather and homework to attend the concert, which was two hours very well spent. This picture was taken from Straight No Chaser's Facebook page. I can actually see myself. 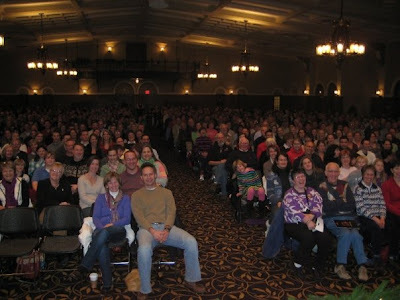 I am in the right-hand group of people, smack in the middle of the masses. From the moment they walked out singing "Signed, Sealed, Delivered," they enraptured us and, throughout the performance, always maintained a light-hearted, entertaining atmosphere. They laughed along with us as they joked about the weather, Kwanza, "White Chocolate," a 12-Step Program for basses wishing to sing tenor, and Chanukah (which happens to be today, and so I wish my Jewish friends a wonderful holiday). Going through a set list that included Jason Mraz's "I'm Yours," "Somewhere Over the Rainbow," "Africa" by Men at Work, and "Can't Take My Eyes Off of You," the men of Straight No Chaser surprised us all when, after intermission, they immediately broke into "Rehab" by Amy Winehouse. My only actually "good" picture; pretty much everything is blurry, sadly. 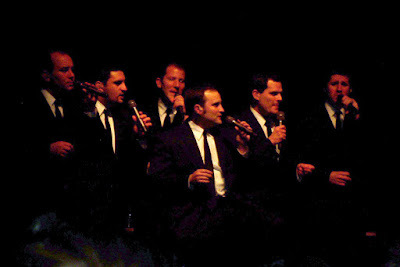 Of course, it wouldn't have been a Straight No Chaser concert without their Christmas songs. Performing "Carol of the Bells," "Christmas Can Can," "Indiana Christmas," "Hark! The Herald Angels Sing" and "Santa Claus is Coming to Town," one of the highlights was performance of "We Three Kings" in 5-4 time. Now, I'm not much of a musician at all, but I do know the difference between meters. However, when one of the members stepped up to explain what the group planned to do, the audience remained silent. Several people around me nodded their heads, but the majority frowned, befuddled. "Wow," he said, laughing into the microphone. "I have never before heard confusion." 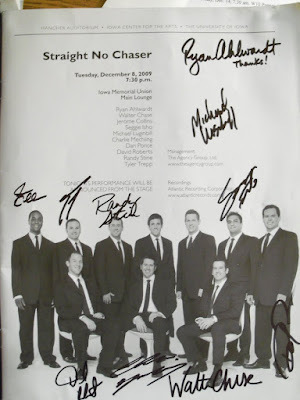 And, just in case you want to listen to that specific song, I have provided a link to Straight No Chaser's website/blog. Furthermore, here is a link to another spot on that same site; it is an animated video of "Christmas Can Can." After the concert, I hung around in the lobby for several minutes, anxious to get autographs. Fellow acquaintances that also attended the concert also waited with me, all discussing the increasingly-nasty weather outside. Already it looked as if two inches had fallen in the time we had been indoors. However, we were soon in a line to receive autographs. "Hi," I said cheerily, greeting the first of ten members of the group. "I hope you're enjoying your time here despite the weather." He smiled. "Yeah, yeah! It was great; it was a lot of fun. Thanks for having us!" He finished signing his name above his picture and passed the playbill down. "When do you leave?" I asked, decidedly choosing to hold a conversation since the line wasn't advancing too far too fast. "We go to Kansas." The guy next to him cut him off. "Oh, jeez! So...you'll be driving INTO the storm!" They laughed. "Hopefully we'll be fine." Moving on down the line, I informed another member that originally attended Purdue University, which happens to be the rival school of Indiana University, where Straight No Chaser originated. The guy currently signing my playbill immediately stopped and slammed his pen down. "I quit! Not for you!" He slid the playbill off the table toward me as the rest of us laughed. "So sorry!" I exclaimed, bending down to pick up my book and handing it back. As I neared the end of the line, my friend and I compared three of the members' identical ties, teasing them on their differing knots. Tyler Trepp, a fellow Iowan, was the last member to sign my playbill before wishing me a "good night." My friends and I parted, and I began my slow trudge outside and up the Pentacrest to the nearest bus stop. Freezing, I inched my way up the hill in the snow, blinking the painful, pelting flakes from my eyes. I smiled. It was worth it. For those of you that don't immediately recognize the name Straight No Chaser, I reccommed that you check out this video. It became immensely popular on YouTube and is now their signature song. (At the concert I attended, they performed it as the first of a two-song encore.) It is also the song that I am "currently listening to."